Where there's smoke, there's fire! This greatly applies to attraction and romance because spark in heart speaks silently by most in the beginning. However, the clues we try to obtain (or ignore) from potential or existing partner can either make us to stray into smoke of uncertainty or end up in perfect disaster (caught in fire!). Can just a single clue given away by other person indicate brewing attraction or romantic feelings about you? This is a grueling question that most of us want to find firm answer for. A recently conducted research claims that a glance gives away the clue or. When a woman develops romantic or intimate feelings about man, she briefly glances at right side in presence of desired man frequently. She does so even if she finds complement given by man more appealing. Coy smile, raised eyebrows and micro-expression of happiness may accompany the glance. Specifically, women have been observed giving an indicative glance more as compared men. Hence, it's widely utilized in television commercials by female models. My own insight about this type of glance is all about how a man and woman normally stand or walk alongside with each other. Most men in this world are right handed and women use to stand at the left side of them. This kind of physical positioning might not be just a cultural norm because men are supposed to protect their female partner. Men can keep their female partner (also children) at left side of their body and attack or defend by arm or weapon hold in their right hands. Thus a woman glancing at right side unconsciously appeals the desired man to position or stand at right side of her i.e. to protect her. So what about men? A man too glances briefly at left side in presence of woman he likes or wants to be romantic with. It perfectly complements with glancing done at right side by a woman. Man wants her woman to position stand at left side of him so that he could protect her. Side-way glancing or looking into eyes of each other can be observed in couples in good spirit. In contract, they tend to look away from each other when they are in troubled relationship, situation or disagreement over something. 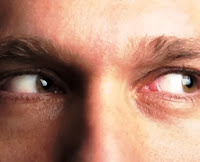 The research about side-way glancing might have been conducted on women seeking right handed men only. Similar observations were not recorded about women seeking left handed men till date. An article about same was published in UK's DailyMail. You can go through entire article by following this link. Also watch this advertisement (in Hindi) in which famous model and Bollywood (Indian) actress Katrina Kaif glances briefly at right side almost twice in presence of the male model. 1) Man's Courtship 2) Woman's Courtship (Part 1) 3) Woman's Courtship (Part 2) 4) Know Who is Attracted to You 5) Couple in trouble?